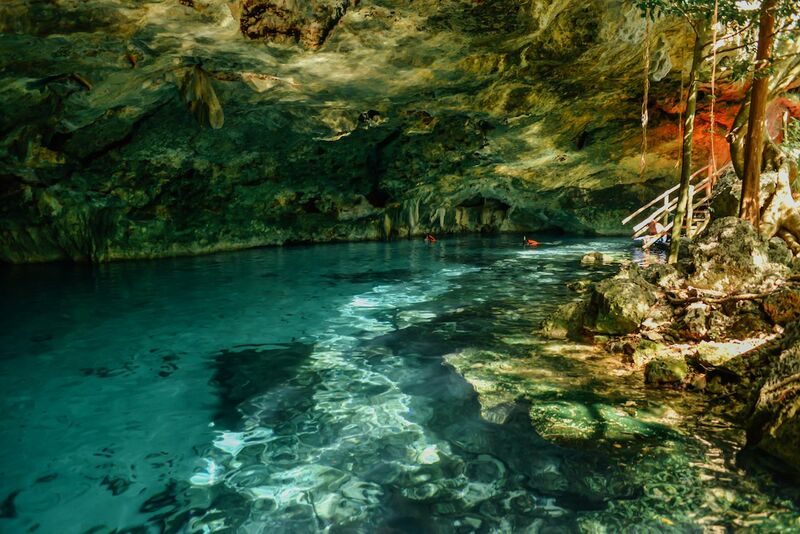 These days, the hottest spots to visit in Mexico are actually pretty cool: cenotes. 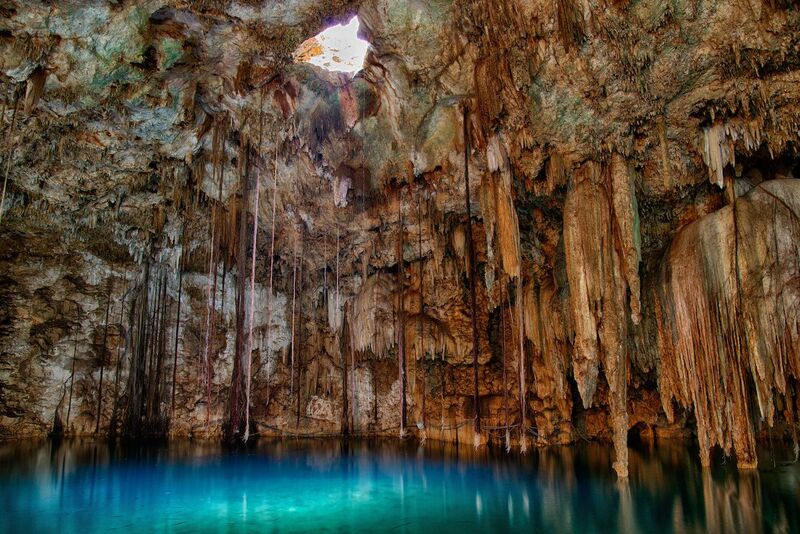 Thousands of these natural wells, formed by sinkholes in limestone, dot the Yucatán peninsula. The cool waters and lush surroundings of cenotes are a welcome respite from the heat of the Mayan Riviera, which means these spots are frequently packed with other visitors. Plan to visit on off hours and you may find yourself alone in an underworld paradise. If you’re ready to jump in, here are the coolest natural, wild swimming pools in Mexico. These three cenotes are located close to one another, deep in the jungle surrounding the village of Coba. Though they are close to the Nohoch Mul pyramid, visitors won’t experience the crowds of other cenotes. If you plan your trip right, you may even have one all to yourself. 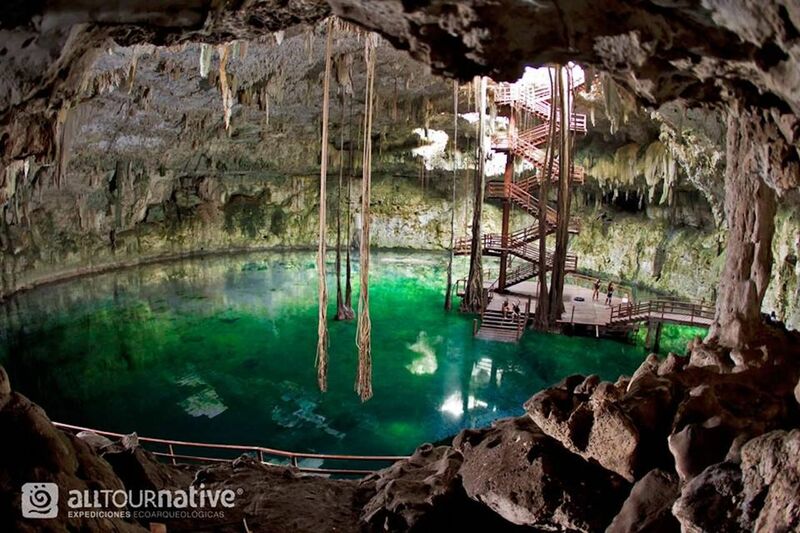 Each of the cenotes is accessed through a small well opening and down flights of wooden stairs. Once underground, you’ll be treated to a dip in cool, unspoiled waters. For the brave-hearted, Tankach-Ha has diving platforms at about 30 feet and 15 feet above the water. This dramatic cavern, dripping in stalactites, is formed by one large pool with three caverns. Two of the caverns are filled with water and great for snorkeling; the other is just fun to peruse. Because it’s located just outside of town, expect lots of other swimmers and also a good management infrastructure — the onsite management offers life jackets and hard hats with the entry fee, and snorkeling equipment and wetsuits are also available for rent. Just outside of the city of Tulum, this cenote is also known as the “Temple of Doom” for a quirky reason — it’s made up of three holes and, from above, looks like a skull. 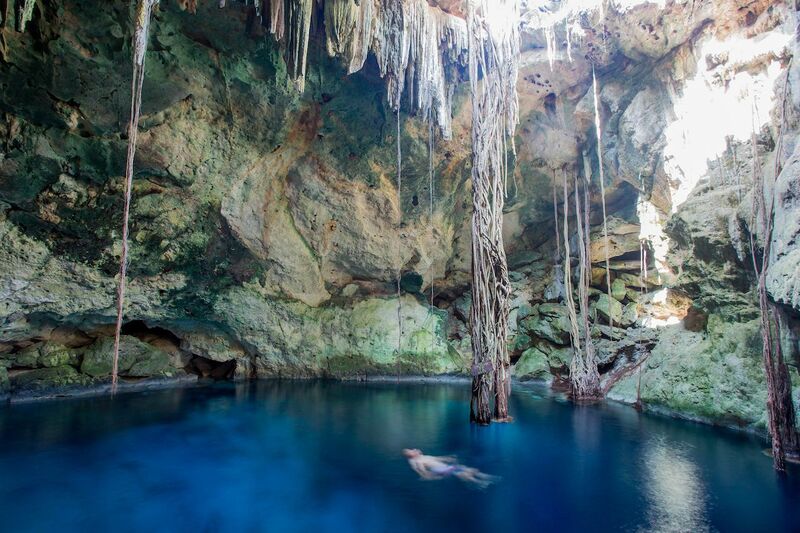 It’s a bit off the beaten path and therefore one of the least-crowded cenotes in the area. Entry is by rustic ladder, and once you’ve taken the plunge, you may notice company far below your dangling toes. Expert scuba divers like to explore the multitude of underwater caves far below the water’s surface. Among the most popular of the Yucatán cenotes, you enter this large cavern down four flights of stairs or, for the more adventurous, by rappelling 85 feet through a hole in the rock above the water. 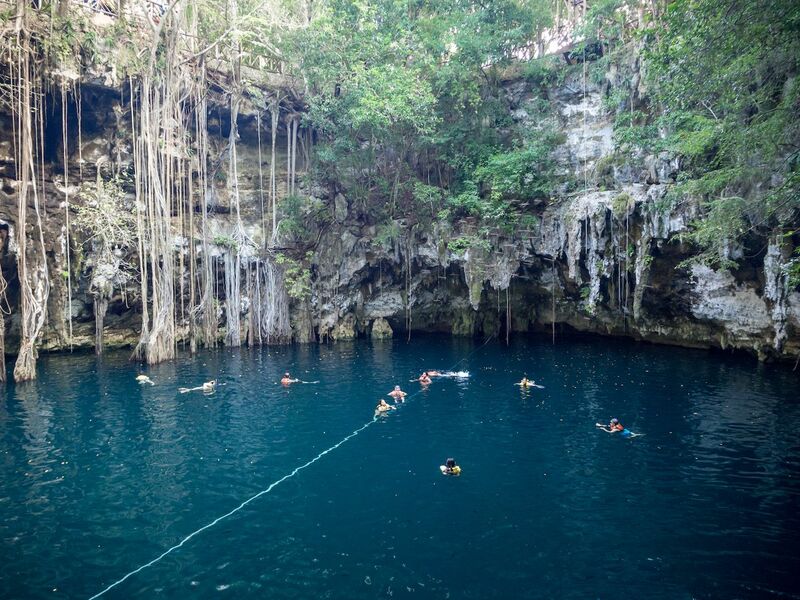 It’s more developed than other cenotes, and the $40 entry fee allows more than a splash around in the cool blue — visitors are also encouraged to swing from “Tarzan vines” or the built-in trapeze zip-line. It’s like Mother Nature made her very own water park. 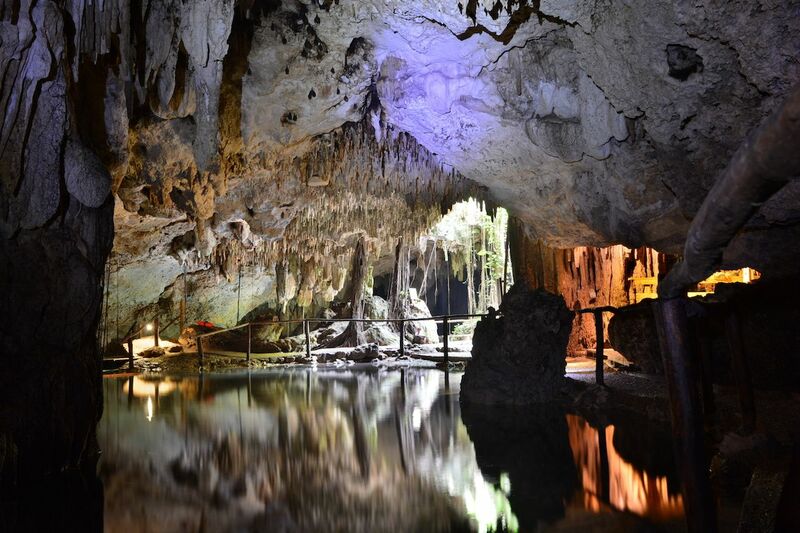 These cenotes are located in a park that also has well-maintained hiking trails and a bevy of craft-market stalls. Samula is the larger but lesser-visited of the two. Roots from trees above stretch down into the cavern’s waters, which are so clear you can see the eyeless, black fish that inhabit them. A hole in the roof of the cenote illuminates the blue water during the day, and at night, purple lights make for an eerie ambiance. The only light in the other cenote, X’Keken, comes from a small hole in the cave roof. At midday, an intense beam shines straight down into the turquoise waters; therefore, you can expect every Instagrammer in the area to be there trying to catch the perfect shot. More popular with swimmers than Samula, X’Keken even has a lifeguard on duty. Because of the number of visitors to these cenotes, it is recommended that you rent a locker for your stuff, or it may leave without you. Ik Kil is one of the most popular cenotes in all of Mexico due to its proximity to Chichén Itzá, but if you’re willing to go 10 minutes past it, you’ll find yourself richly rewarded. Most people don’t spend the extra time to get to Yokdzonot; therefore, this cenote is relatively calm and even, at times, deserted. Yokdzonot is run by local villagers who have put much effort into keeping it as natural as possible, so you may not be absolutely alone in your soaking — birds, dragonflies, and other indigenous creatures also enjoy the solitude of this wildly beautiful spot. Just off the beach highway north of Tulum, these cenotes are part of one of Mexico’s most expansive underwater cave systems. This network of caves runs at least 38 miles, sometimes at depths of over 350 feet, and is known worldwide as one of the best dive spots in Mexico. The “two eyes” that give these cenotes their names are Blue Eye and Black Eye. 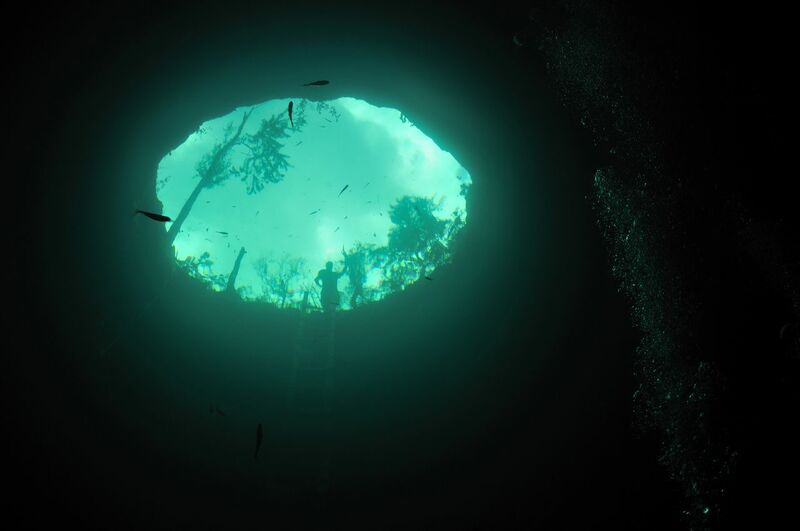 Blue Eye is light-filled and popular with divers because of its underwater access to another cavern that is home to a large population of bats. (So basically, it’s the Bat Cave.) Black Eye has almost no light and is therefore popular with swimmers, divers, and snorkelers keen on sensory deprivation. The best of both worlds! One of the top diving spots in the Mayan Riviera, Gran Cenote is part of the cave system that also includes Dos Ojos. It’s a different experience than most cenotes in that it is actually a series of cenotes connected by wooden walkways through thick jungle. These cenotes are less rocky than others and have white sandy bottoms just like the nearby beach. Snorkelers here can lazily float from spot to spot and maybe even catch a glimpse of the resident fish and turtles. This small town outside of the flamboyant colonial capital of Merida is pocked with cenotes of every kind. 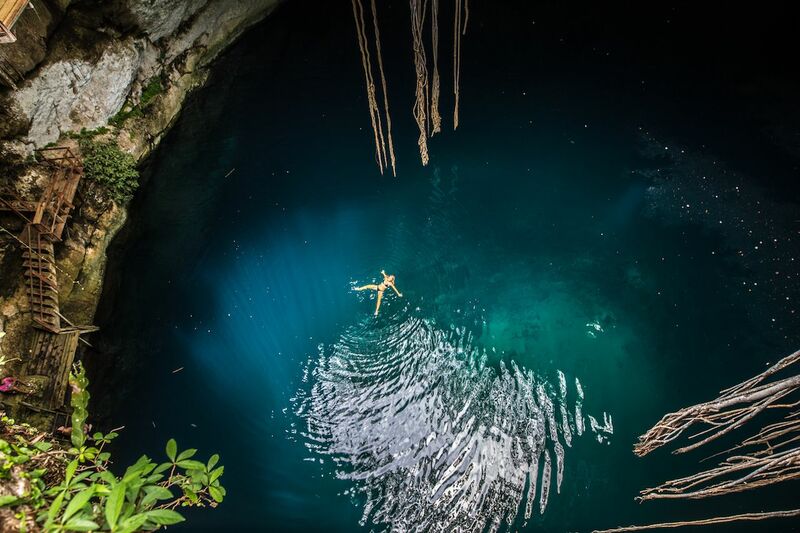 Among them, you’ll find beautiful cenotes for swimming (Yax Bacaltun), caving (Santa Cruz), and photography (San Antonio, which the locals have lit with a rainbow of mood lighting). 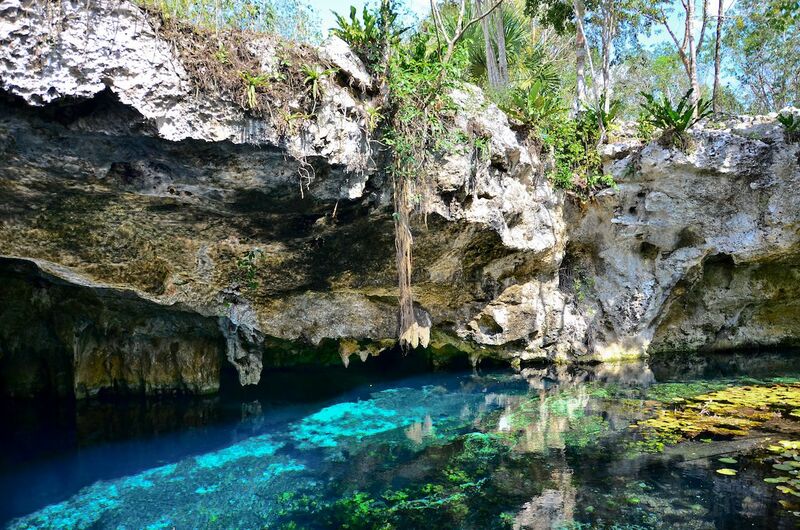 Other options include the root-lined cave of Chacsinicche, stalactite-dotted Bolonchoojol, or one of the many unnamed cenotes lurking in the jungle. Exploring the cenotes here is a great chance to practice your Spanish; spend some time here and get to know the locals — they know where all the good spots are.